When the Houston Astros took Carlos Correa with the first overall pick in the 2012 draft, it left a lot of people scratching their heads. While there was never a consensus number one, Correa's name still didn't pop up in a lot of the conversations. But now as the shortstop continues to develop and a likely MLB debut gets closer, the Astros front office is looking good. 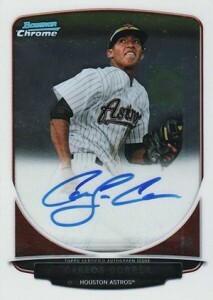 Shop for Carlos Correa cards on eBay. Correa is one of many young pieces Houston has developed or acquired in recent years. It's been a long road for fans, but it could be paying off in a short time. Correa enters 2015 as Baseball America's fourth-ranked prospect. MLB.com pegged him at three. From a hobby perspective, unless he develops more power, Correa likely will never be a megastar. That said, he has a lot of tools to capture a good amount of attention. 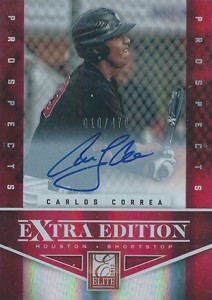 A slick fielder, Correa has a good bat as well. While there's little question about where his batting average will be, there's a big difference between doubles and home runs when it comes to collectors. That said, the shortstop is still young. As he gets older and his body fills out, today's doubles could clear the fences in the future. Like any prospect, there are still plenty of unknowns, but a lot of the positive signs are there. Even before his MLB debut, collectors have hundreds of different cards to choose from. Here are some highlights of cards that should stand out over time. Although it may not have quite been the first signed Carlos Correa card to officially hit the market, the 2012 Bowman Draft Perfect Game Autograph has his earliest cardboard signature. 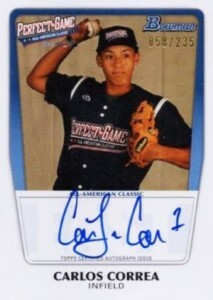 Signed at the 2011 high school all-star game, the autograph is a more detailed than those used in sets even a short time later. Players were also given copies that have found their way to the secondary market. For many players, these have been prone to forgeries. Certified, pack-inserted versions can be easily spotted thanks to the serial number on the front. 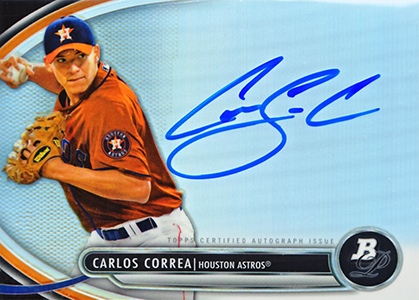 Leaf included Correa in several of their 2012 products. Leaf Metal Draft delivers a chromium look complete with colorful Refractor-like Prismatic parallels. Base versions are not serial numbered but parallels are. The 2012 Leaf Ultimate Draft uses a more subdued design versus Leaf's other main releases that year. Mostly white, there are only a few foil highlights. The white backdrop adds some pop to the on-card signature. Valiant, the card maker's ode to Donruss Crusade inserts, uses regal designs and refracting backgrounds to create a distinct look. Numbered parallels come in several different color combinations. 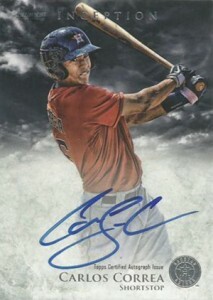 While Topps pretty much held back on including Correa in their 2012 products, Panini made the first overall pick a focal point of Elite Extra Edition. While he has several inserts and autographs in the set, his main card comes numbered to 470. The card is hard signed. This card doesn't get as much attention as it's Chrome counterpart. And it might be overlooked. Available only in retail packs, it's not easy to find. In fact, it's downright tough. The sticker is a definite drawback, though. If you see a basic Bowman card with a signature, it's one that was signed in-person or through-the-mail and not pack inserted. The image would also be different. Not everyone has the budget for a Carlos Correa autograph card. 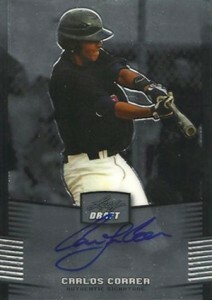 If that's the case, the 2013 Bowman Chrome Prospects card might be the next best thing. It's cheap and the chromium finish gives it more pop versus the paper Bowman version. 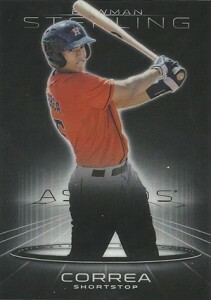 And what would Bowman Chrome be without Refractors galore. It's worth noting that this card is inserted in 2013 Bowman Baseball packs. 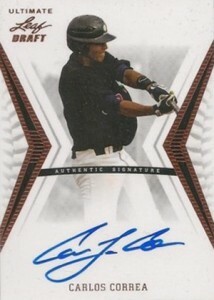 This is the cornerstone of Carlos Correa cards. His first autograph card in an Astros uniform, it might not be a "rookie card" by traditional definitions, but it's what a lot of collectors consider to be the modern equivalent. Even though others had earlier autographs of the shortstop, like Leaf and Panini, there's a lot of tradition behind the Bowman Chrome brand. Like the base version, it's in 2013 Bowman Baseball. 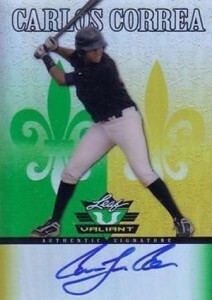 2013 Bowman Inception takes the prospect theme and took it in a very different direction as far as design goes. The all-autograph product has an HDR look that's distinct to the brand. 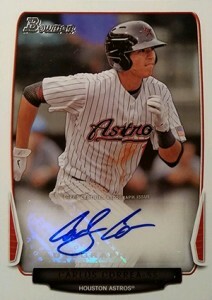 The signature is still on-card, but the Correa is cheaper than his Chrome autograph. 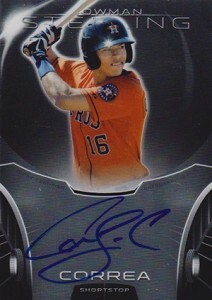 The 2013 Bowman Chrome Prospect Refractor Autograph of Carlos Correa isn't cheap. If you're a fan of the extra shine, Bowman Platinum is a solid -- and cheaper -- alternative. All the Prospect Autographs come as Refractors. 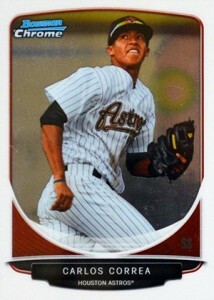 Good luck finding the regular 2013 Bowman Sterling Carlos Correa in any quantity. Base cards are in short supply in the autograph-heavy product. Factor in the base Refractors and there's not much room left over. It's a pricey product where most of the attention is on the signed cards. The result -- this card is overlooked and might be a decent target for those with tighter budgets. The last Bowman product of the year, as well as the one with the most autographs, the idea of diminishing returns comes in to play. Not as fresh as the first sets, the result is usually lower prices. But that might not be a bad thing for bargain hunters. 2012 Elite Extra Edition Carlos Correa First Pick Jersey Card BGS 8.5. I’m in aww of how much his chrome autos are currently going for on da bay! Just the base is insane! He hasn’t even played a game in the majors and as stated isn’t hitting for power. However I believe that will change. He is still very young! And collectors love there SS!!! Someone has to take over the Raines for Jeters retirement! As Tulo just isn’t doing what he once was! I like Addison Russell’s prospects moving forward…..but this young man seems to have it all. Range, avg, etc! The homers will come, IMO! Which boxes is the 2013 bowman chrome auto in? Bowman, Bowman Chrome, Draft Picks? 2014? Thanks! JW � It’s in 2013 Bowman.